Can I Be In Your Book? Well, Kinda…. “Am I going to be in your book?” an online date asks. “Well… it’s complicated,” I reply, dashing his hopes of discovering himself to be a romantic hero. Actually, people and situations in my life do appear in my books, so much so that any of my friends or acquaintances, or that young woman mysteriously knitting at the bar of a trendy café, could show up in some way in an upcoming novel. However, it’s never a one-to-one correlation between life and fiction. Just to show you how it works for me, I want to talk about how my dog appears in my new release, The Soldier and the Single Mom. His heart still racing, Buck stepped out the back door of the clinic for some air…and heard a whining, scratching sound at his feet. There was a closed cardboard box, a couple feet square, with holes punched in the sides and an envelope on the top. Uh-oh. He picked up the box and carried it inside. “Drop-off,” he said to Troy and set the box down on the floor. He handed the envelope to Troy, then grabbed a pair of forceps and used them to open the box gingerly. No telling what he might find. Could be something wild and scared, even rabid. But when he got the box open, a dirty white mop flung itself out and planted front paws on Buck’s leg. When he bent to pat what looked like its head, the little dog licked his hand, barking and whining. He squatted down. “Okay, buddy. It’s okay.” He stroked the matted, dirty fur. “What’s in the envelope?” he asked Troy. The little dog’s whole body wagged. Now, how muc h of that scene is reality and how much did I fictionalize? Whereas my daughter and I picked out our dog at a shelter, I made Spike a drop-off, by an owner who is broke but still cares enough about his pet to leave $6 to care for him. I wanted to emphasize the poignancy of an old man having to give up his companion animal, and I also needed the dog to be an element of an already-existing scene at the vet’s office, with Buck and Troy. So there you have it. If you know my boy Porter, you could certainly guess that Spike is based on him. But there’s not a direct correlation; some details are changed. Right now, I’m working on a Love Inspired novel, and I need a pet! Probably a dog. If you’ll share some details about your dog or another rescue pet here—or over on my Facebook author page, where you can also post a picture—I might pick your pet to be adopted by a single mom’s four troubled kids in a book that’s coming out in 2018. Warning: some details will probably be changed! If you want to hear about my upcoming releases and get a free short story, be sure to sign up for my newsletter. Interesting to hear how real life becomes a springboard for fiction. Porter is cute- how much input do you have into your cover designs to use him on the cover? We do not have a dog- we used to foster customs pups before they started their training, but when baby number 2 came along- it got to much! I miss the pups, but love that we no longer have to build a fortress around the garden to protect it! Customs pups-sounds interesting! I get to suggest scenes for book covers, and the one on “Soldier” is one I suggested–little Bobby’s first step. Aw…Porter sure is a cutie, Lee. I’m glad you rescued him. Although we don’t have any pets, we’ve adopted many in the neighborhood. One woman has four rescue dogs….Lucy, a little Pug is my favorite. Porter is a cutie. My son rescued two dogs – an Australian sheep dog named Wrigley and a pug named Soldier. (Our son was born in Chicago and is a baseball fan.) Since being married we were given a canary winged bee bee parrot named Laura and a hermit crab named Hermie. Hermie was an escape artist, while on vacation under the care of my father, he got out. We looked everywhere and thought Hermie was a goner, but a week later he crawled out of my son’s closet. Most of our rescues have been cats. Mimi came with a church parsonage – we could not believe the former pastor left the cat behind. According to the church custodian Mimi had been a shelter cat and had lost her tail after not crossing the street quickly enough. It took Mimi three moves before she finally realized, we were not going to abandon her. Smokey, an American shorthair, I received from my pastor husband from the church treasurer in exchange for a computer. Smokey survived a house fire. 18 months later we adopted his half sister crabby tabby Abbey, who was the runt of the litter and would not have survived the winter in a barn. Pets make the best stories. Our first Sheltie, McBeth saved the church windows from being shot out by some delinquent teens. He barked and my husband yelled through an open window “This is the voice of GOD speaking.” Scaring the teens to death. My sons all got A’s on their version of the story for English class. Renate—your house sounds like our. :) But I have to ask about your bird. My dh owned a pet store for years and we raised birds. We have a blue and gold macaw, (Chiquita) a mustache parakeet, (Poirot) and a lilac headed parrot, (Lila). What is a canary winged bee bee parrot? I’d love to see a picture! Hilarious story about your husband and the voice of GOD! And I love the names you give your pets. Lee–Thanks for sharing about your dog. I rarely have pets in my books and if I do they are cats. :) We have a rescue dog, Hutch–rescued from a parking lot. He’s 90 lbs of crazy—a mix of hound and bird dog–totally obsessed with my dh–then we have 2 cats, Nessie and KC–rescued from the wilds of life as well. And the three birds mentioned above. I’m totally a cat girl. But I think I would love having a little dog–not sure. I have a friend who’s had 3 Bostons. They are adorable as well. Thanks for commenting, Lindi. I love birds and used to have them… but… how do your birds and your cats get along??? A canary winged bee bee parrot is green with yellow on its wings. Similar in size and green color to a love bird. Due to a house fire, I’m not sure I have any pictures. If you google Canary winged bee bee parrot, there are some good pictures. Hope that helps, Lindi Peterson. Hi—thanks for your info. I will Google pics. :) I’m sorry about that house fire. I have a friend who recently lost everything that way. It’s tough rebuilding. 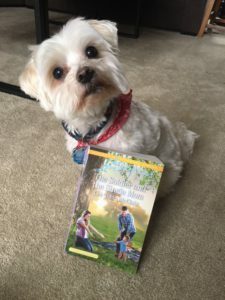 Lee- thank you for sharing your dog with us readers! :) We have a border-collie black lab mix named Lexie for over 6 years. We adopted her from our local humane society. Our three kids had wanted a dog for a long time, and we had kept saying no. At the time, the 2009 recession had affected us badly and we just didn’t have the extra funds to support a dog. God eventually blessed my husband’s new trade business with more work, and we finally adopted Lexie for our kids. She’s now 11 years old and enjoys when I walk her around my neighborhood. I’ve done the same thing in my own writing! In my first novel, ‘The Cedar Chest,’ I had written that my main character had a black lab-border collie mix named Minnie who brought her and her kids comfort when her husband died. Interesting to hear how you connect real life to fiction. I always wonder if authors based their characters on real people (or traits and quirks). I like the rescue story , I want to see what happens next!! We got a dwarf rabbit as a rescue from the local animal shelter. It took a while for her to overcome her skittish tendencies. She was all black with splayed hips, so she liked like a seal when she hopped . She was really sweet and loved to be petted. Your dwarf rabbit sounds so cute, Diana! And Priscila, you can see that is IS real people… kind of. Love your story on the dog! Can’t wait to read this book and see how he plays out in the story. We have four little dogs, two big dogs that are my daughter’s, a rabbit, and an old cat (she’s 19). My animals have shown up in my stories as well. I love adding them to the story! A way for readers, when I get published lol, can get to know my furry friends. Wow, you have some pets! A 19-year-old cat… she’s been part of your family for a long time, huh? Yes, I’d had a cat before my husband and I married. She died one summer, and a few days later Tim came home with this cat. She’s been there ever since she was about 4 weeks old. He sounds like a real cute addition to the story, and I love how you mix things up from fact to fiction. We’ve mostly had cats over the years, though before I was married I had a retriever mix and a german shepherd was given to me. Had lived out in an area they could run, but when I moved back to town, I found homes for both of them. Seems like a lot of people have cats… hmmm. Maybe I should go in that direction next time. Such a great story, Margaret! Those are the kind of details that might well find their way into a future book of mine, if it’s okay with you. Cats are definitely easier, Autumn! Love to read about pets. My Bookie is a cat,that was sort of a rescue because he came from a home with lots of cats. He was a runt and now at 2/1/2 he is still small. He is a blessing and comfort to us. Hi, Linda! Our cat, Trouble, is also small–he was a barn cat–but he lives up to his name and is larger than life! Porter is so cute! We have a 17 pound terrier mix. We rescued him from a shelter that rescued him from the streets. His name is Hobo. He is a fun little dog with lots of personality. I forgot to tell you a couple of stories about Hobo. One day we came home and he had a gift bag around his neck. He had gotten into the candy from Halloween and ate everything. We had wrappers everywhere! He was so hyper that he ran and ran and ran! The next day he had a sugar crash and slept all day long. Thankfully he never got sick from all that sugar! He also got into my container of chocolate chip cookies. He had stashed a bunch. Every half hour, he would show up with a cookie. We looked everywhere and never could find his stash. He is a fun, entertaining dog! I have a friend who wanted his name in a book, so I made him doctor, who was a very minor character. People & critter watching or observing is fun. I will post a picture on you Facebook page of my crazy Molly dog. My mom thought I should start a blog about the crazy things she did. Fun post, Lee! I love it when pets show up in novels. I’m halfway through The Soldier and the Single Mom and really enjoying it. Well done. I enjoyed your post, Lee! What a cute dog. Pets in stories always add a fun touch. We just got a german shep/border collie mix pup that hub’s sister could not handle…so hyper. He is almost too much for us, but he is so lovable. My first shelter pet was a dog named Cody who we called our “90 lb. lap dog”. Our vet had thought he would be about 40 lbs. but apparently Cody missed that memo. Several years later we added a shelter cat to our family. I would have been just as happy getting another dog, and I think that the cat, Dickens, knew that. Pretty much since the day we brought him home he has done his best to change me from a dog person to a cat person and let me tell you, he’s been very successful. He makes me laugh out loud at his antics almost every day and he’s super sweet and affectionate. He’s also a great lap warmer in the winter. Thank you for sharing your thought process. Although nothing is published yet, I get similar questions from my beta readers wondering who a particular character is. My favorite word to explain is amalgam. I recently picked up a cardboard coaster from a local brewery because the name of their pale ale is Amalgamator! C’est moi! We have a scruffy pup that we adopted from the pound 4 years ago. The vet says she looks like a miniature wolfhound, if there were such a thing. She is a smart dog. I was able to train her not to eat or chase our chickens in a very short period of time. As a mom, the thing I love about Gwennie the most is her bravery. We live in Arkansas and we see a fair amount of snakes (usually in the spring). On three separate occasions she has stepped between a snake and us. Once she snatched up a snake and shook it! For her size (35lbs) she has a big, brave, and tender heart. I’ll share a photo on twitter. Sounds like a great story. We don’t have any pets, so nothing to really share. Awww.. Both those dogs sound really cute!